Some people call it yo-yo dieting. This is when you gain weight and then you lose it and then you gain it back again, then maybe you lose it. It can be really frustrating, but that is actually not all. There's a recent study in The New England Journal of Medicine that finds this could also be harmful to people who already have heart disease. Here's NPR's Patti Neighmond. 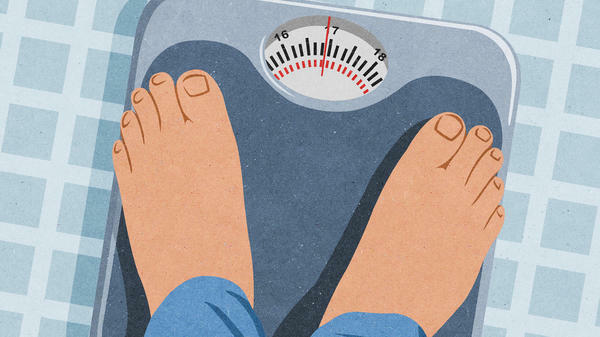 PATTI NEIGHMOND, BYLINE: One reason why people slide up and down the scales might have to do with unrealistic goals, says cardiologist Martha Gulati with the American College of Cardiology. NEIGHMOND: Gaining back all those lost pounds. Researchers wanted to see how this affected the heart. They looked at the weight of more than 9,500 people over four years who already had heart disease. They found those who gained, lost and gained again were more than twice as likely to suffer a heart attack or stroke than those who maintained a stable weight. Gulati says it could be due to a stress hormone called cortisol which goes up and down along with weight. GULATI: It affects blood pressure. It affects diabetes. It can affect cholesterol levels. NEIGHMOND: All well-known risk factors for heart attack and stroke. Now, patients with heart disease who are overweight or obese should lose weight, Gulati says, they just need to work hard to keep it off. That's a lot more difficult with age. LINDA VAN HORN: The older we get, the less calories we need. NEIGHMOND: Linda Van Horn is a nutrition researcher at Northwestern University. VAN HORN: If a person who is 60 is eating the same number of calories they ate when they were 20, even if they haven't changed their physical activity they will be considerably heavier. NEIGHMOND: Because metabolism - the rate of burning energy - decreases over time starting in the mid-20s. So as people age, it's even more important to keep an eye on the scale and cut back when pounds increase because it's a lot easier to gain, says Van Horn, than it is to lose. The study was funded by the drug maker Pfizer. Patti Neighmond, NPR News. (SOUNDBITE OF LYMBYC SYSTYM'S "NEW VARIETIES") Transcript provided by NPR, Copyright NPR.